Four hotsy-totsy young lovers are on the lam from the high-hats’ world of rules. Along the way, madness ensues when the lovers’ paths cross with the king and queen of the fairies, a company of (not very good) actors, and one very impish sprite named Puck. As Lysander says, “The course of true love never did run smooth.” Full of madcap chases and magic, A Midsummer Night’s Dream is a humdinger of play. A play all about the absurdity of love – complicated, wonderful, icky, ridiculous, glorious love! “We are such stuff as dreams are made on.” Magic, illusion, vengeance and forgiveness, The Tempest tells the tale of Prospero and his daughter, Miranda, exiled, stranded on a mystical island. 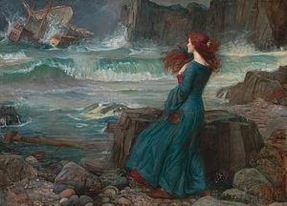 Possessing magical powers, Prospero is served by the only inhabitants, a spirit, Ariel, and a deformed monster, Caliban. Seeking revenge, Prospero conjures a powerful storm to shipwreck the conspirators, stranding them on the island. On the verge of vengeance something truly magical happens, the power of love drives Prospero to forgiveness. Romance, drama and comedy entwine in Shakespeare’s final play. Moliere’s sparkling comedy takes his usual situation—a family in chaos and disarray—and turns it on its head. This time, rather than the father trying to be something he is not, it is the women of the family who are being duped by Trissotin, an untalented fraud. Dueling poets, a henpecked husband, and those ridiculous ladies all add to the satirical fun. This is Moliere at his best and brightest.